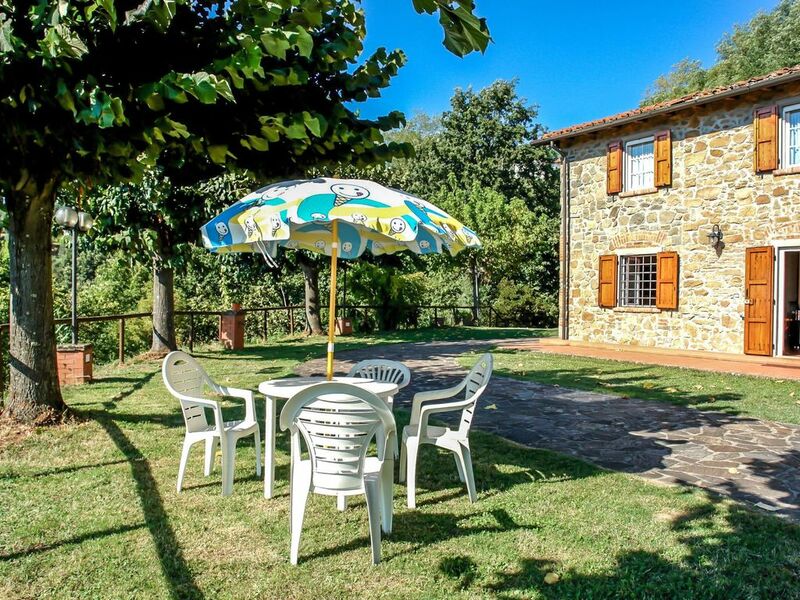 Beautiful country house "Casa Montecatini", semi-detached, renovated. 2 houses in the residence. Above Montecatini, 6 km from the centre, in a secluded position on top of a hill, in the countryside. For shared use: property 2'000 m2 (fenced) with flowers and trees. Private: well-kept garden 200 m2. Terrace, garden furniture, barbecue. In the house: internet access, heating to be paid on the spot. Parking at the house on the premises. Shop 2 km, supermarket 6 km, restaurant 5 km, railway station "Montecatini" 6 km, sandy beach 45 km. Golf course 8 km, tennis 6 km, riding stable 6 km. Nearby attractions: Lucca 35 km, Pisa 50 m, Firenze 50 m, Vinci 45 m. Please note: the owner lives on the same property. "Casa Montecatini", 4-room semi-detached house 110 m2 on 2 levels, on the ground floor. Spacious, beautiful and tasteful furnishings: entrance hall. Large living/dining room with satellite TV. Exit to the garden. Kitchen (4 hot plates, oven, dishwasher, electric coffee machine) with dining table, open-hearth fireplace. Exit to the garden, to the terrace. Sep. WC. Upper floor: small living room. Exit to the veranda. 1 room with 2 beds. 1 double bedroom. Shower/WC. Balcony, 2 terraces. Terrace furniture, balcony furniture, deck chairs. Marvellous, of the countryside and the resort. Facilities: baby cot for up to 2 year olds. Internet (WiFi, extra). Please note: private entrance. We had a wonderful 10 day stay at the property. The house was as described and did not disappoint. The kitchen was well equipped but an electric kettle would have been very useful. The steepness of the driveway was a surprise to us and our car. The owner was very kind and understanding, when our satnav couldn't find the property he came down to the town to meet us. Would recommend the house and the views which were fantastic.